Dorothy’s Woods, a 2.68 acre, mostly wooded parcel, is one of the largest undeveloped properties in Takoma Park. The City purchased Dorothy’s Woods at an IRS auction in 2015 with the primary intent of preserving it as open space. The property later became subject to foreclosure and was scheduled to be sold at auction in September 2018. After much consideration, the Council authorized a settlement with Fairview Investment Fund, the holder of the lien on the property, involving a payment of $250,000 to Fairview in exchange for the dismissal of the foreclosure action against the City’s property and the release of the City’s property from the lien. As a result of the settlement with Fairview and the City’s earlier negotiation with HUD for the release of the City’s property from its lien, the City’s property is now free from the $382,600 Fairview lien and the $624,800 HUD lien. The total expenditure of City funds to purchase the property and obtain the release of the Fairview and HUD Liens is approximately $235,000, including legal fees, the payment to Fairview, and the purchase price at the IRS auction. This total is net of resident donations and the recovery of previously unpaid property taxes. The City purchased property at IRS tax auction for $253,000, about $69,400 of which was donated by residents advocating for the purchase of the property. The City paid outstanding property taxes in the net amount of about $35,500 on the City-owned portion in order to record the deed for the property. At that time, total City payments for ownership of the property equaled $288,500. The surplus proceeds from the IRS auction of the portion of the Washington-McLaughlin property which was purchased by the City of Takoma Park—i.e., the amount realized from the IRS auction, in excess of the IRS lien—equaled approximately $186,400. These surplus proceeds were due and paid to Montgomery County to be applied to the Real Property Tax Bills of the Washington-McLaughlin Church School, satisfying the amounts owed for levy years 2008 through 2012. Takoma Park received $161,500 of the property tax amount paid from the IRS surplus proceeds in two separate payments. The rest of the tax payment went to other taxing authorities, such as the State of Maryland and Montgomery County. For levy years 2012-2016, the City received $202,600 for remaining outstanding Washington-McLaughlin property taxes. These property taxes are not related to the IRS auction or the City-owned parcel. The City received the Declaration of Covenants dated November 9, 2017, and recorded on November 28, 2017, in Book 55281, Page 492 among the Land Records of Montgomery County, Maryland. In September 2018, the City entered into an agreement with Fairview Investment Fund, the owner of the Deed of Trust secured by the Dorothy’s Woods property, to prevent the sale of the property via foreclosure auction and preserve the City’s interest in and control over the property. Pursuant to the agreement, the City paid Fairview $250,000 in exchange for Fairview’s release of the Dorothy’s Woods property from the lien of the Deed of Trust and Fairview’s dismissal of its foreclosure action against the City, in which it sought to collect approximately $382,600 from the sale of the property. About $100,000 of the payment was contributed by members of the public. There are no other encumbrances in the land records for the property, but the State has two judgment liens against the Washington McLaughlin Christian School for unpaid Maryland withholding taxes, one from 2009 for $13,410 and one from 2012 for $2,646. The liens are enforceable against the assets or property owned by the Washington McLaughlin Christian School (WM) at the time, including the City parcel. September 12, 2018: The City entered into an agreement with Fairview Investment Fund, the owner of a Deed of Trust secured by the Dorothy’s Woods property, to prevent the sale of the property via foreclosure auction and preserve the City’s interest in and control over the property. Pursuant to the agreement, the City will pay Fairview $250,000 in exchange for Fairview’s release of the Dorothy’s Woods property from the lien of the Deed of Trust and Fairview’s dismissal of its foreclosure action against the City, in which it sought to collect approximately $382,600 from the sale of the property. The City Council made the decision based on its recognition of the importance of the environmental benefits of the parcel. Approximately $100,000 of the negotiated amount will be paid for using donations from a group of people who, on their own accord, offered funds with the goal of potentially supplementing City funds in order to maintain City ownership of the parcel. The Council will be discussing where the remainder of the unbudgeted funds will come from, whether through cost savings or from reserves, at a future work session. On September 5 and 11, 2018, the Council met in closed sessions to discuss the upcoming foreclosure sale and potential action by the City. On August 22, 2018, the City received the Notice of Foreclosure Sale dated August 20, 2018. The sale is scheduled to occur on September 13 at 10:30 in front of the Circuit Court in Rockville. On August 16, 2018, we learned that Fairview had reinstituted its foreclosure action regarding the City’s parcel and the parcel will likely be offered for sale at a foreclosure auction on September 13, 2018. On May 17, 2018, we learned that the bankruptcy court granted Fairview’s motion to lift the automatic bankruptcy stay today without a hearing. The court granted the request without a hearing because opposition had not been filed (there were no grounds for the City to do so). On March 13, 2018, Fairview Investment Fund filed a motion in the Washington-McLaughlin School’s bankruptcy proceeding asking that the court lift the automatic stay in bankruptcy so that it may proceed with its foreclosure action against the City’s property and the Washington-McLaughlin property. The foreclosure action has been pending since November 21, 2016. The City learned on April 5 that the bankruptcy court had lifted the stay, so Fairview was free to proceed with the foreclosure action. However, Fairview failed to serve its motion to lift the bankruptcy stay on Washington-McLaughlin School’s creditors, so the bankruptcy court rescinded its order lifting the stay and scheduled a hearing on the motion for May 17. In early March 2018, the federal suit was dismissed and HUD’s release of its lien on the City’s property was made final. In mid-February 2018, the City learned that HUD agreed to release its lien on the City’s Dorothy’s Woods property. This leaves one remaining encumbrance on Dorothy’s Woods, a lien held by Fairview Investment Fund. 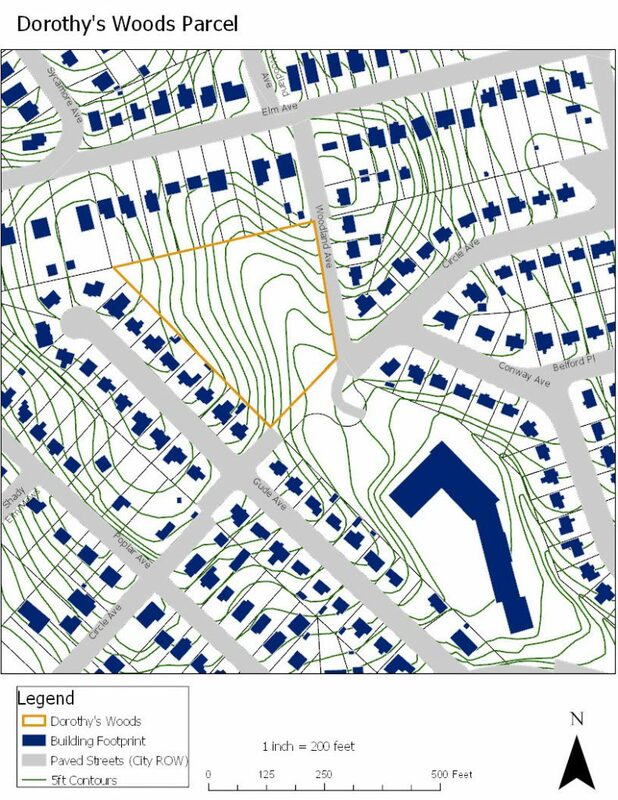 On January 18, 2018, the City learned that the U.S. Department of Housing and Urban Development and Fairview Investment Fund, the two entities that hold liens on both the City-owned Dorothy’s Woods property and the adjacent Washington-McLaughlin Christian School-owned property, reached an agreement in which HUD granted Fairview’s lien on the City’s property priority over HUD’s lien. HUD entered the agreement with Fairview over the City’s objection and despite the City’s efforts to advocate in opposition to the settlement between HUD and Fairview. On November 1, 2017, the Council placed a covenant on the Dorothy’s Woods property for preserving the property as open space for the use and enjoyment of the public and to maintain permanently the open space value of the property by prohibiting future alternations, development, and construction activities on the property that might damage, compromise, or interfere with the existing natural conditions and tree canopy. On October 11, 2017, the U.S. District Court conducted a hearing on motions filed by the City and HUD seeking to dismiss a federal complaint filed by Fairview Investment Fund seeking to establish the priority of its lien over the lien held by HUD and clear its way to foreclose upon the City’s property. The court declined to dismiss the case, but accepted the City’s argument that Fairview is precluded from filing the claim if it did not file its claim within six years of the accrual of its claim. The court decided that when the claim accrued is a question of fact that could be decided only after the development of evidence on that question through the discovery process and consideration of a subsequent motion for summary judgment. The judge referred the case to mediation and will require Fairview, HUD, and the owner of the non-City owned portion of the Washington-McLaughlin to attend. Notice of Foreclosure Sale dated August 20, 2018.